Italy’s answer to the United States’ Groundhog Day came and went yesterday, confirming that we can expect another six weeks of winter here. This isn’t altogether bad news. We’re hoping for a proper freeze, enough to exterminate any dormant olive fly larvae wintering over in the soil of local olive groves. Nothing too extreme, though, since extreme cold at the wrong time (like early spring) represents another kind of trouble for olive farmers. So we’re hunkering down, but consoling ourselves with long walks, recipes that involve a long stove-top simmer and the occasional crunch of chiacchiere, those crackling, light-as-a-feather Italian carnevale sweets that are impossible to stop eating. 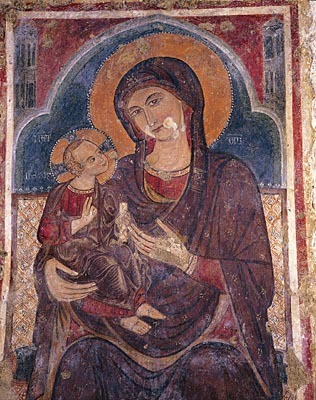 A detail from one of the many cave churches found carved into the ravines around Massafra, this fresco depicts Mary’s presentation of her child to the church for the first time (Photo credit: http://www.viaggi.donnamoderna.com). 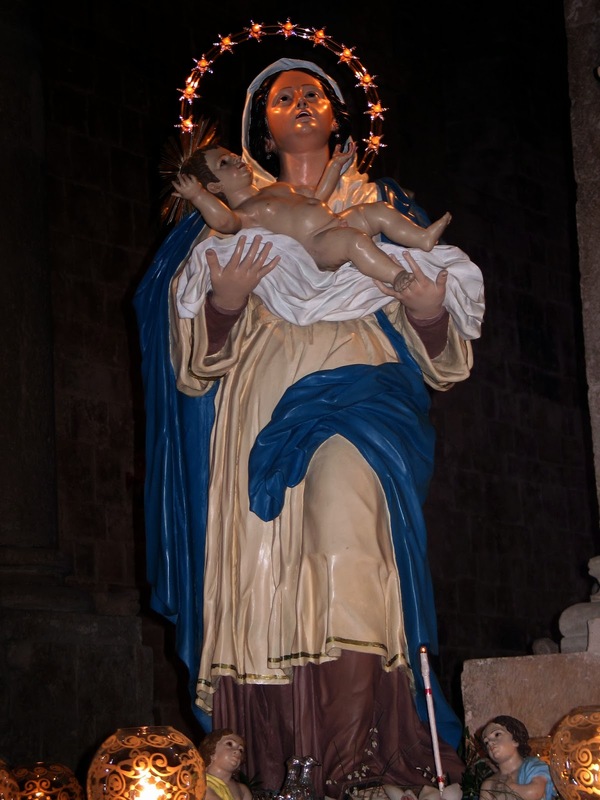 This cartapesta (papier-mache) statue of the Virgin Mary presenting her child to the church is the centerpiece of every town’s Candelora procession. 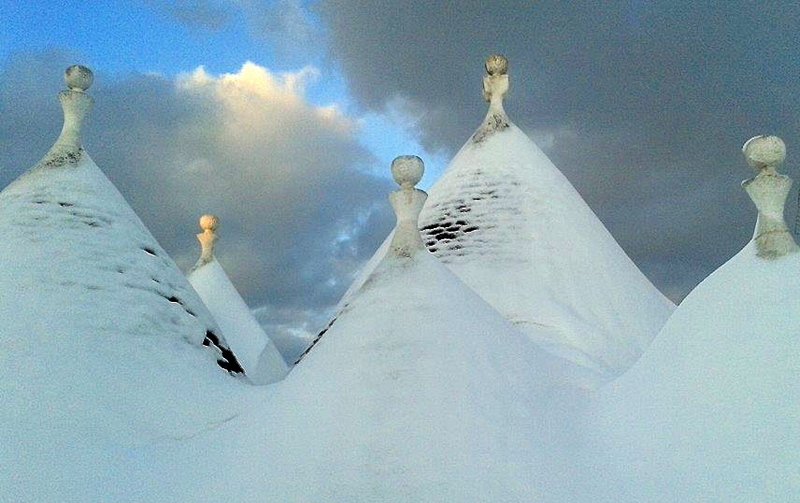 This one comes from Molfetta, near Bari (Photo credit: http://www.lamiasettimanasanta.com). The feast of Candelora was originally called the Purification of the Virgin Mary; in some southen Italian towns, it still is. In Jewish tradition, women were considered impure for the 40 days after the delivery of a male child and weren’t allowed to worship in the temple. After 40 days had passed, women were brought to the temple to be purified in a ritual ceremony. Not coincidentally, February 2nd is 40 days after December 25th, the day the Catholic Church celebrates the birth of Jesus. This traditional Christian festival also marks the presentation of the infant Jesus in the temple. 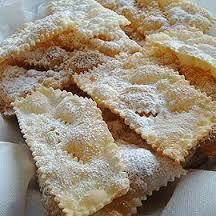 Chiacchiere, pre-Lenten treats that appear soon after Christmas until Martedi Grasso (Fat Tuesday), remind us of the religious and agricultural calendars that organize the Italian year. Madonna), holy days seem to fall 40 days apart from one another. Lent, for example, is called quaresima in Italian. Quaranta, the Italian word for the number 40, is the source of the name for this pre-Easter time of sacrifice and reflection. But these 40 days are probably rooted in ancient agricultural practice. After all, St. Martin of Tour’s Day, which is celebrated on November 11th, falls conveniently 40 days after the wine grape harvest, providing an opportunity to give thanks for a bountiful year. It won’t come as a surprise that St. Martin is the patron saint of vintners. 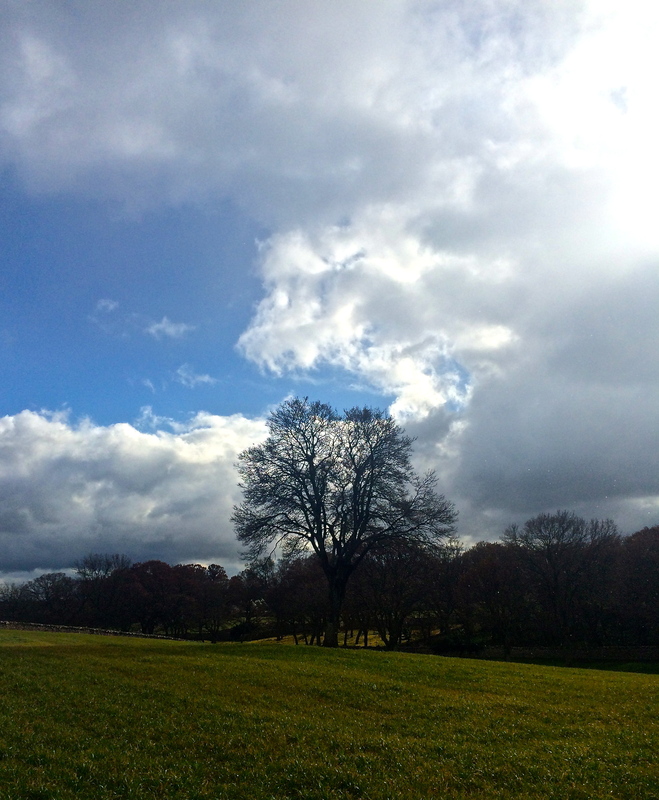 In between dark clouds and a powerful wind from the south, we saw enough sun on February 2nd to confirm that winter will be with us for another six weeks. Along with religious lore, Italians have an endless supply of sayings related to the weather and one’s ability to foresee it. As we are learning, agrarian economies are held hostage by the whims of Mother Nature. Our corner of Italy is no different, so we’re learning a whole new repertoire of phrases to go along with our new identity as olive farmers. Yesterday’s Candelora offers this wisdom: “Per la Santa Candelora se nevica o se piove, dell’inverno siamo fuori, ma se è sole o solicello, siamo sempre a mezzo inverno.” (“For the Holy Candelora, if it snows or if it rains, we are through with winter, but if there is sunshine or even just a little sun, we are still in the middle of winter.”) We’re not putting the scarves, mittens and boots away just yet. We started walking with the sun, then the sky grew dark and rain started to fall as we made our way back to Martina Franca. We honored the light of the world in our own way yesterday by taking a long walk to the next town, Locorotondo, and back again. After some brief sunshine in the morning, skies darkened, wind whipped through the olive trees and rain fell sporadically as we made our way back to home base in Martina Franca. Because this is small-town Italy, no fewer than three cars driven by friends stopped to offer us a lift into town. When we explained that we hoped to stick it out, preferring to get some much-needed exercise after the unbridled excess that is the Italian holiday season, we were met with incredulity. So much so that one of the drivers actually doubled back to ask us again, shaking his head as he drove away. It was another moment to marvel at the kindness of this place, at the lightness in a sometimes-dark modern existence. Stuffed cabbage rolls just out of the oven. We arrived home to find an especially welcome portion of leftover stuffed cabbage waiting for us, which everyone knows is so much better on day two. This relatively healthy dish is comfort food served without the usual side of guilt—highly recommended for cold days. I made a huge portion of it earlier in the week since it’s a little time-consuming to pull together. But take the time, maybe on a Sunday, and your efforts will be rewarded all week. The version I’ve included here isn’t vegetarian, but stuffed cabbage is an ideal candidate for vegetarian and vegan households. Just substitute the meat with sautéed mushrooms or even cooked beans. And it’s highly adaptable to whatever you have on hand. I had both leftover risotto rice and black rice, just a small quantity of each, so I combined them for the filling. Use your imagination (and the odds and ends in your vegetable bin) to develop your own custom take on this northern Italian classic. 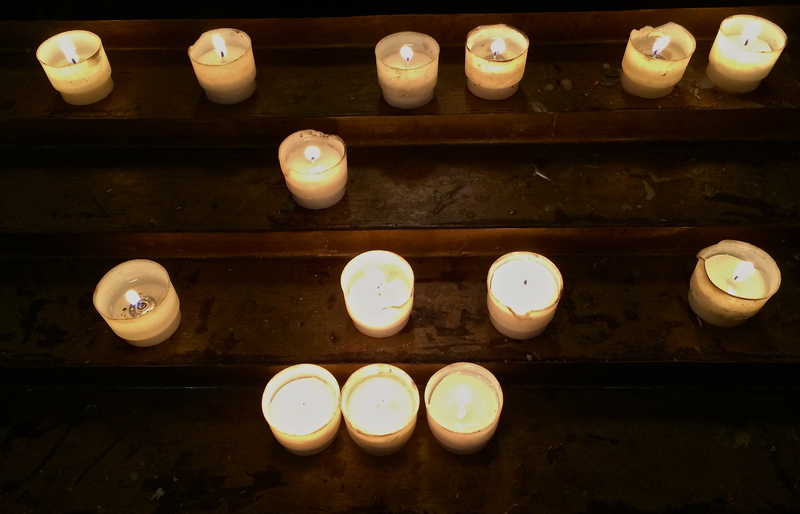 And light a candle to celebrate all that is good in the world. Verza or green cabbage, is the backbone of this dish. Look for one with big leaves and a nice, tight head. Sweet and sour tomato sauce offers a slight variation onclassic tomato sauce, providing a stronger foil for the cabbage and its filling. 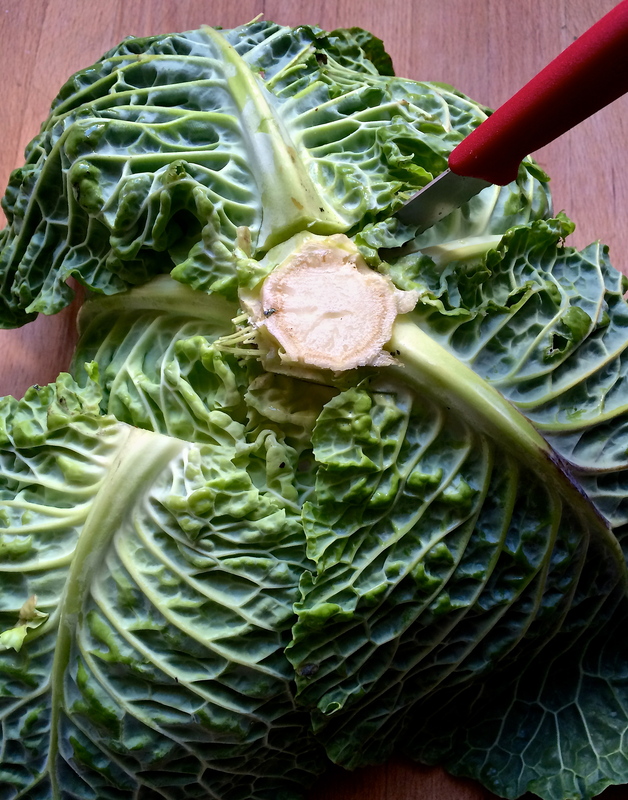 After peeling off the loose outer leaves of the head of cabbage and reserving them, core the cabbage by turning it upside down and inserting a knife at an angle deep alongside the edges of the core. 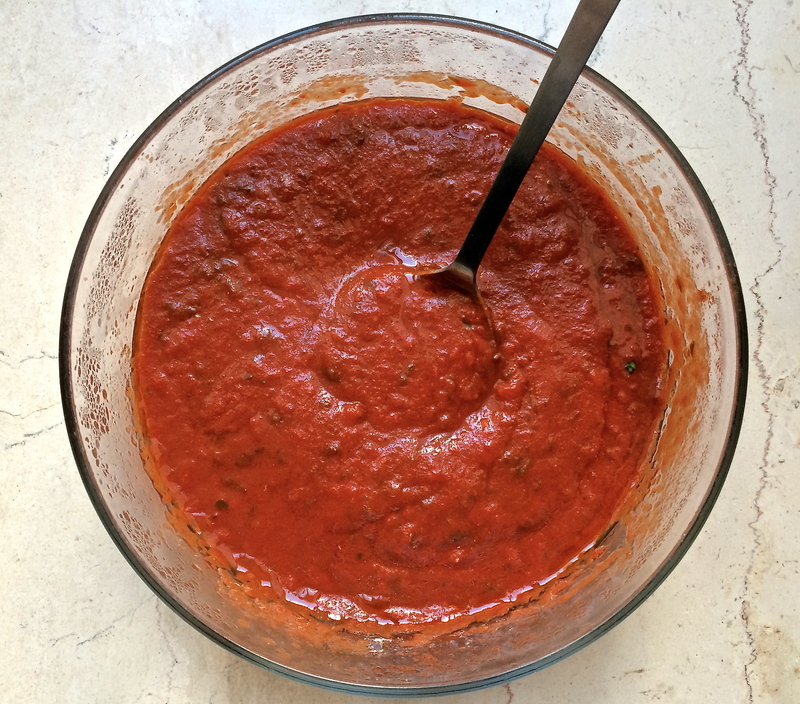 Make the sauce: Cover the bottom of a 3-quart saucepan with the olive oil and place over medium-low heat. Add the garlic and let it turn just slightly golden; remove. Add the tomatoes and cook, stirring occasionally, for 5 minutes. Add the vinegar and sugar or honey; simmer, until the sauce thickens, about 5 minutes. Season with salt and pepper and remove from the heat; allow to cool while you make the cabbage rolls. 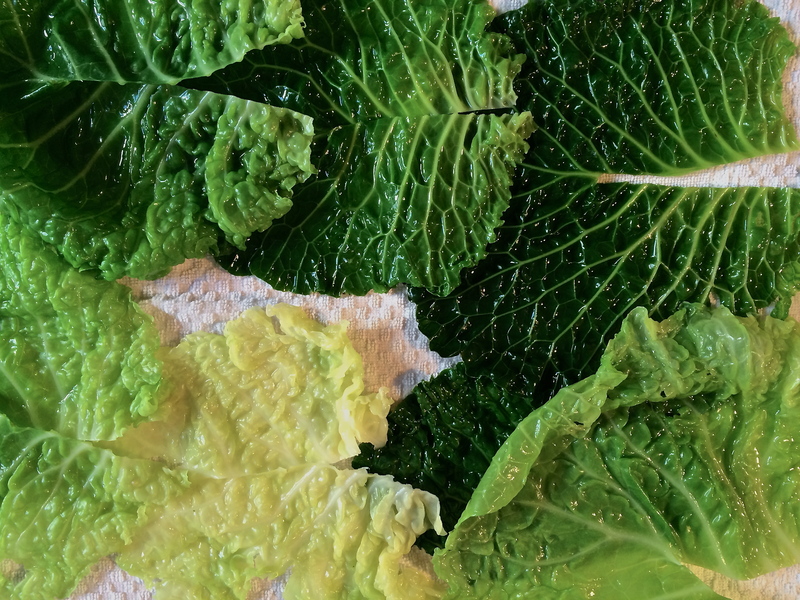 After blanching the cabbage leaves quickly in boiling water, drain them and remove the hard center rib of each leaf. Place the leaves on a kitchen towel to dry. Make the filling: Place a skillet over medium-low heat and coat with 2 tablespoons of the olive oil. Sauté the onion and garlic for about 10 minutes until soft. Stir in the tomato paste, a splash of wine, parsley, and 1/2 cup of the prepared sweet and sour tomato sauce, mix well and and remove from the heat. Combine the ground meat in a large mixing bowl. Add the egg, the cooked rice, and the sautéed onion mixture. Toss the filling together to combine (bot be careful not to over mix or the filling will tend to be tough), then season with a generous amount of salt and pepper. Place about half a cup of filling on each leaf, then roll it up from the former stalk end, closing the sides of the leaf as you roll. Make the cabbage rolls: Bring a large pot of salted water to a boil. Remove any damaged outer leaves from the cabbages and set aside. 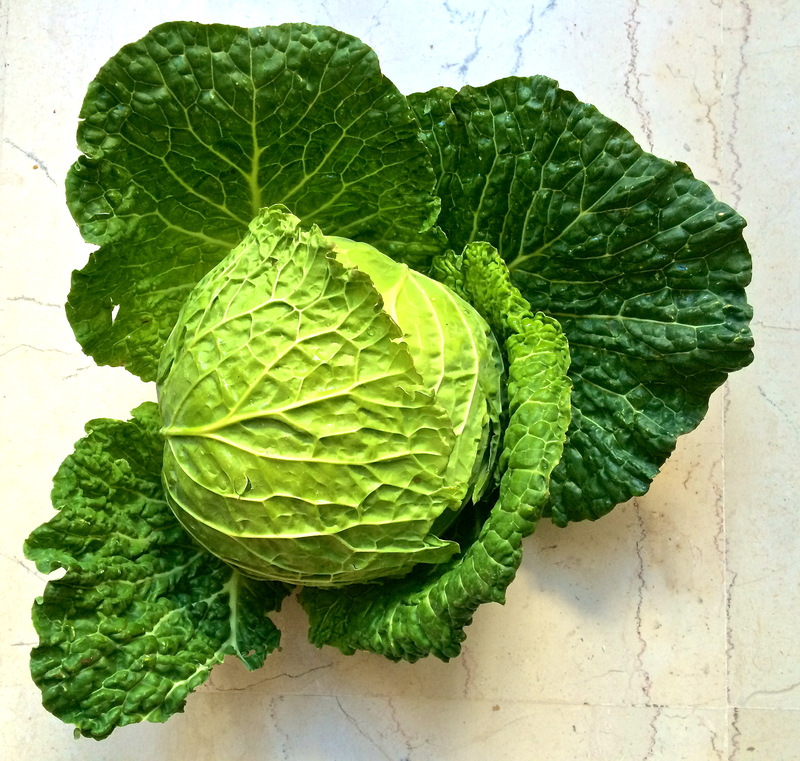 Cut out the cores of the cabbages with a sharp knife and carefully pull off all the rest of the leaves, keeping them whole and as undamaged as possible, (get rid of all the small leaves and use them for coleslaw or whatever.) Blanch the cabbage leaves in the pot of boiling water for 5 minutes, or until pliable. Run the leaves under cool water then lay them out to drain. You should have about 20 good-sized leaves. Place the roll seam-side down in the prepared casserole. Next, carefully cut out the hard center vein from the leaves so they will be easier to roll up. Take the reserved big outer leaves and lay them on the bottom of a casserole, let part of the leaves hang out the sides of the pan. This insulation will prevent the cabbage rolls from burning on the bottom when baked. 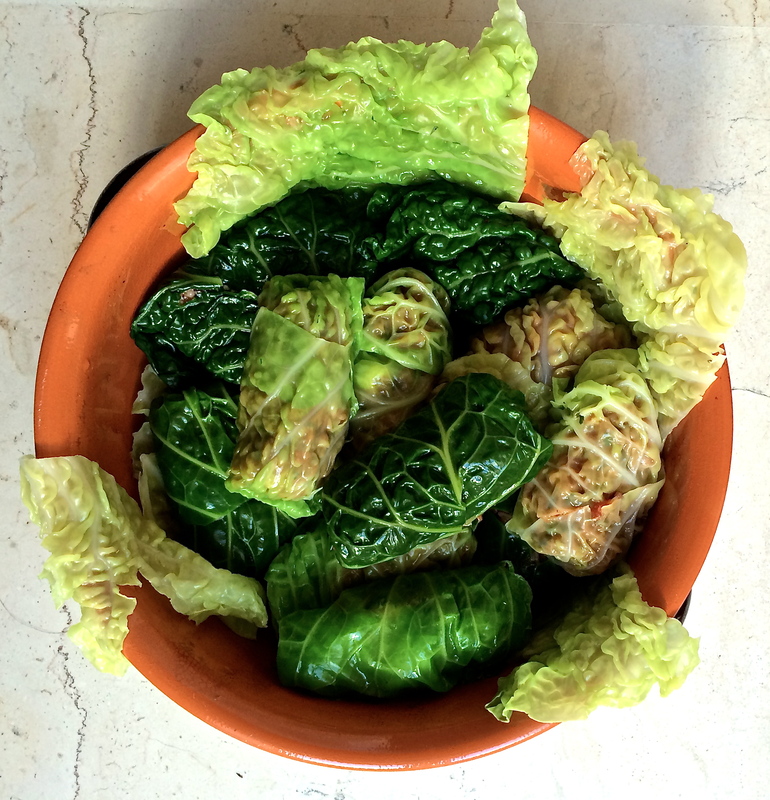 Use all the other leaves to make the cabbage rolls. Put about 1/2 cup of the meat and rice filling in the center of the cabbage. 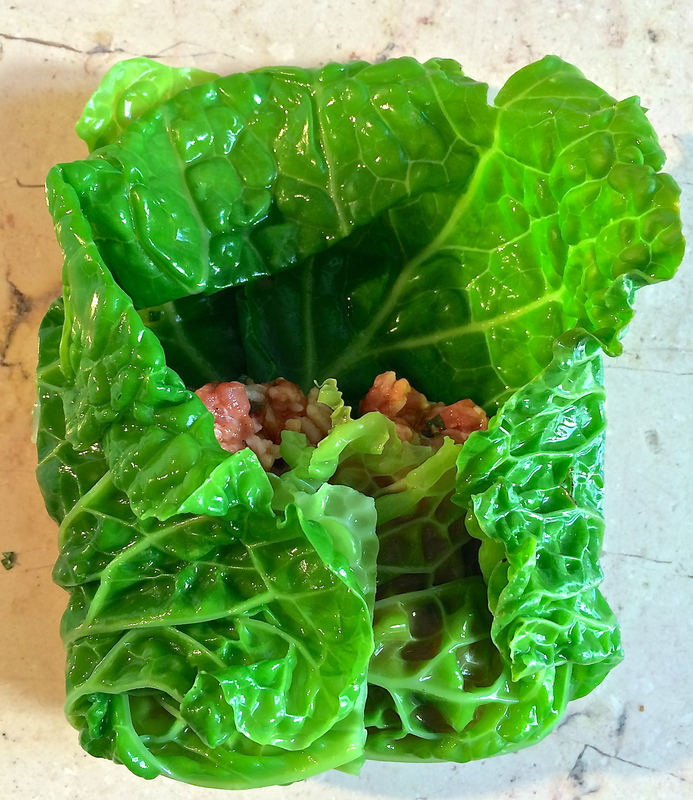 Starting with what was the stem-end, fold the sides in and roll up the cabbage to enclose the filling. 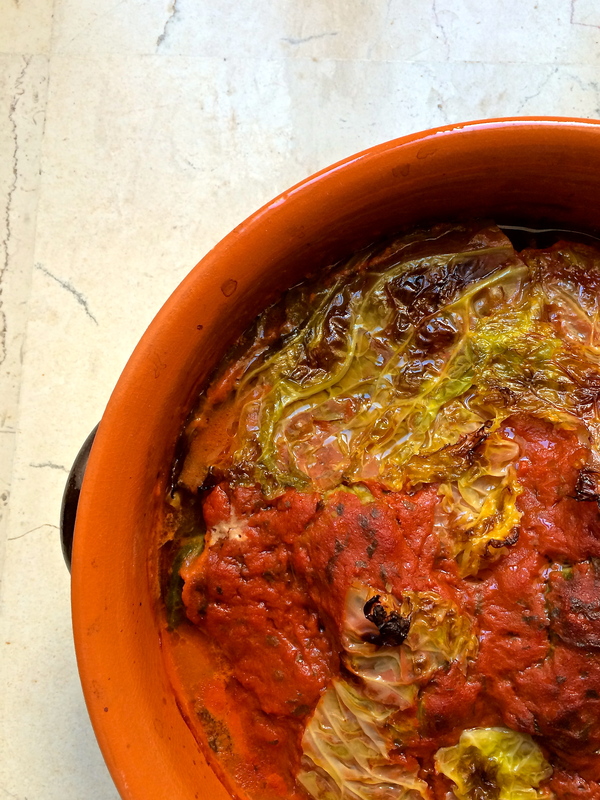 Place the cabbage rolls side by side in rows, seam-side down, in the casserole pan. 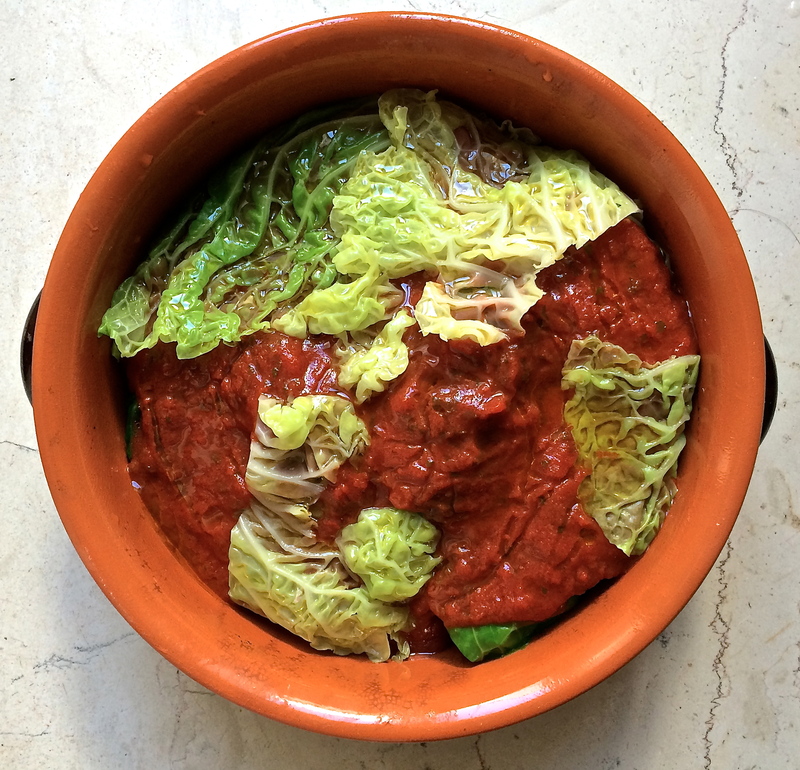 Place the cabbage rolls in the prepared casserole, leaving the largest leaves to drape over the top of the casserole when it is full and the tomato sauce has been added. Pour the remaining sweet and sour tomato sauce over the cabbage rolls. Fold the hanging leaves over the top to enclose and keep the moisture in. Drizzle the top with the remaining 2 tablespoons of olive oil. Bake for 1 to 1 ½ hours until the meat is cooked. 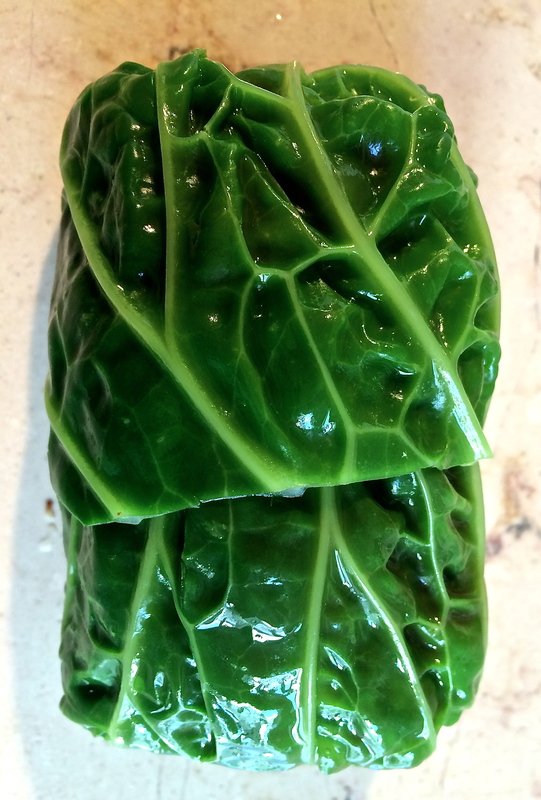 The cabbage rolls, covered in tomato sauce and extra cabbage leaves, are ready to go into the oven. If you’re making these ahead of time, make two casseroles of the cabbage rolls. Freeze one of them for another meal; to reheat, place the frozen dish in an unheated oven, turn the oven on to 350 degrees and cook for at least 1 ½ to 2 hours. Alternatively, defrost the casserole a day ahead of time and bake according to the directions above. 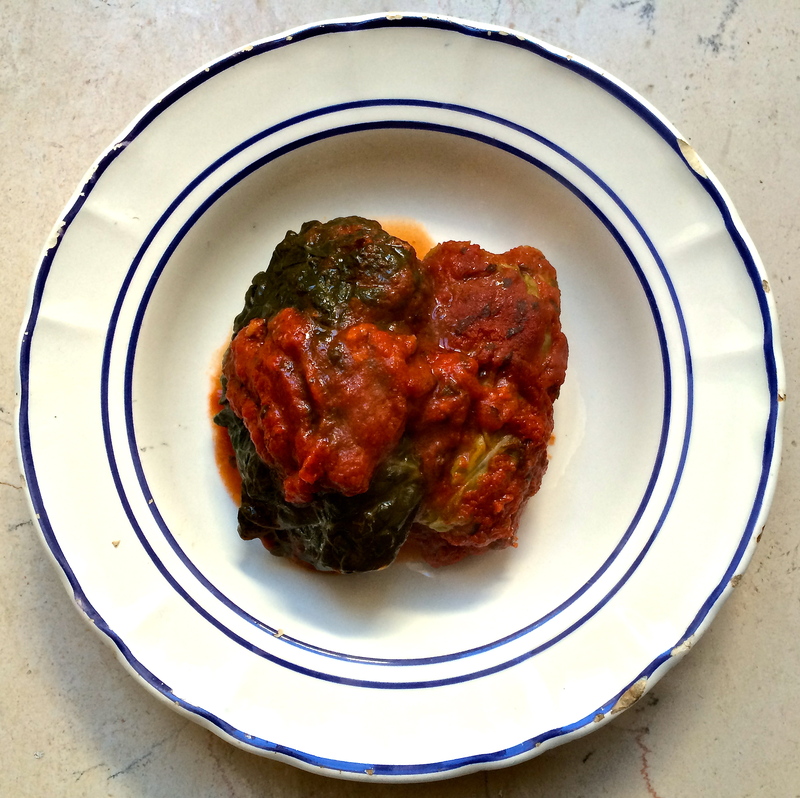 Leftover stuffed cabbage, a dish made for wintry days.